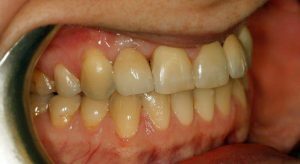 This gentleman worked in sales and had worn a partial denture for many years when he joined the practice, we examined his mouth and bite carefully and discussed his options. The gentleman decided that he would like to consider an adhesive bridge rather than a dental implant for the sake of speed, cost and also to avoid surgery. The bridge was prepared, impression taken and sent to our laboratory, around 10 days later the bridge was fitted which was then made over 2 visits. Bridges are fixed in place so that they cannot be removed easily. Many denture wearers who swap to a bridge comment that they enjoy increased confidence to laugh or smile without worrying as they once did about their denture moving. 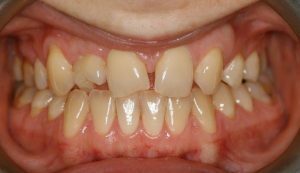 Bridges are used in many areas of the mouth both at the front and back. As each bridge is hand made it is as unique as you are and will be created to work in harmony with the rest of your teeth.